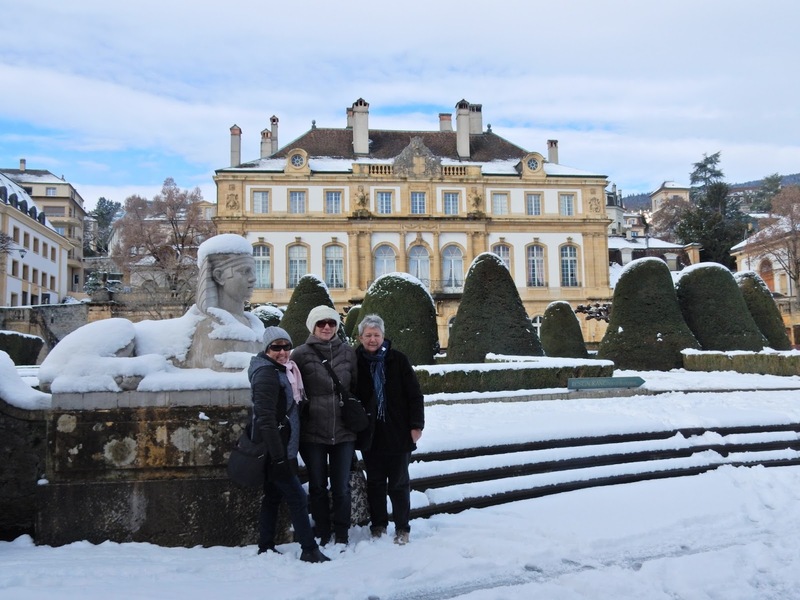 The required photo at the Hotel du Peyrou, this time with snow. The mid-point of January marked two weeks of good company for me. When I took this job abroad, I urged my retired friends to "come on over". So it was that Susan, Regan and Ruth arranged their schedules to spend the latter half of the month with me. The snow outside my apartment building. There were snowmen on the waterfront to greet my friends. While the city provided a chilly reception to my friends, the Neuchâtel staff and students brought lots of warmth. We celebrated the end of the semester with parties, dinners out, and a talent show. 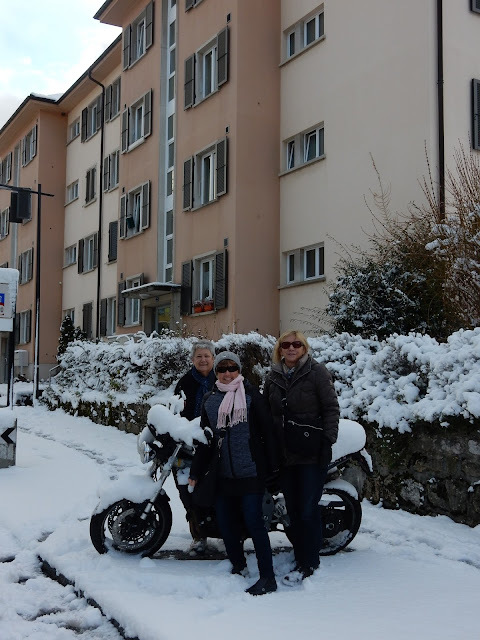 Susan, Regan and Ruth arrived on Friday at lunch time. 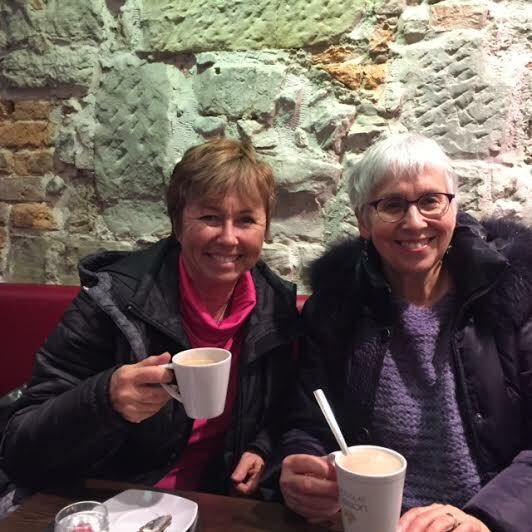 I had not scheduled much on their first day, allowing for jet lag, but that evening, they tasted their first fondue at La Taverne Neuchâtelois. Bill and Terry joined us, thus beginning a week of inclusiveness for my guests. On Saturday, we woke up to a fresh snowfall and very chilly temperatures. 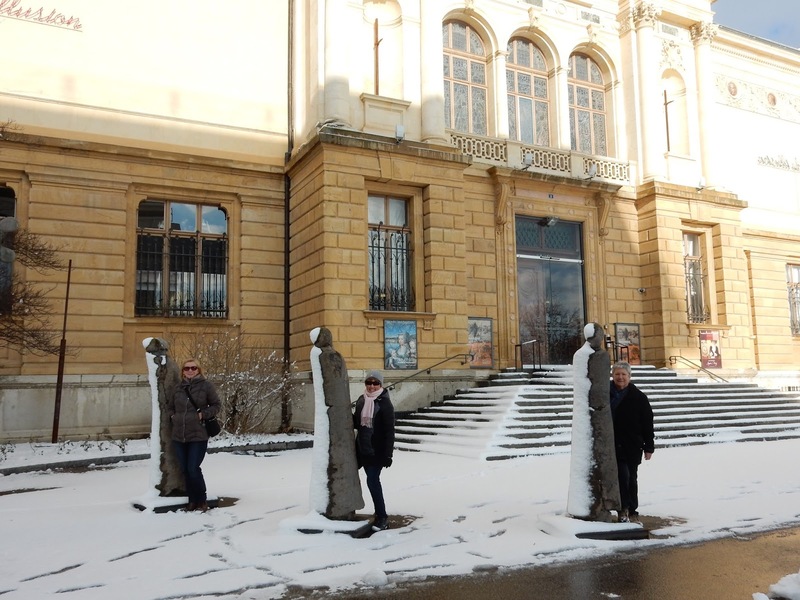 Undaunted, we headed out to explore the sights of Neuchâtel on foot. After visiting the Saturday market and a couple of shops, we headed to a local tavern, Les Brasseurs, for lunch. That day, one of our goals was to shop for a pot luck dinner at Terry's that evening. 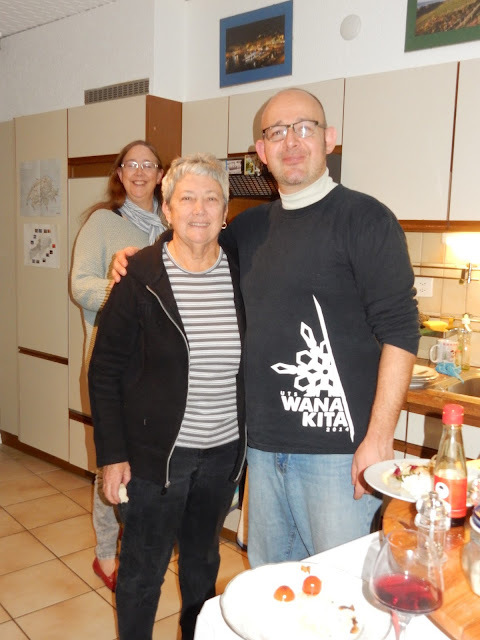 Another was to squeeze in a visit to Susan's friend, Barbara, who was staying with her son in nearby Cormondrèche. It was busy, but we managed both tasks. 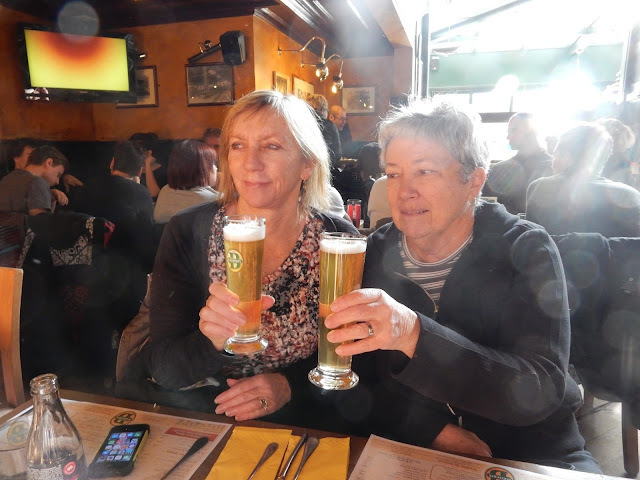 Susan and Regan say "santé" at Terry's. I left preparations for the pot luck in the hands of my guests, while I used every spare minute to grade papers. I wanted to spend time with my friends, but I had work to do as well. That was the case for much of the first week of their visit. Ruth connects with Woburn grad, Adam, while Patti looks on. At the party, the "girls" were again impressed with the welcome they received from my wonderful colleagues. This was a very fun evening full of good food and laughter. 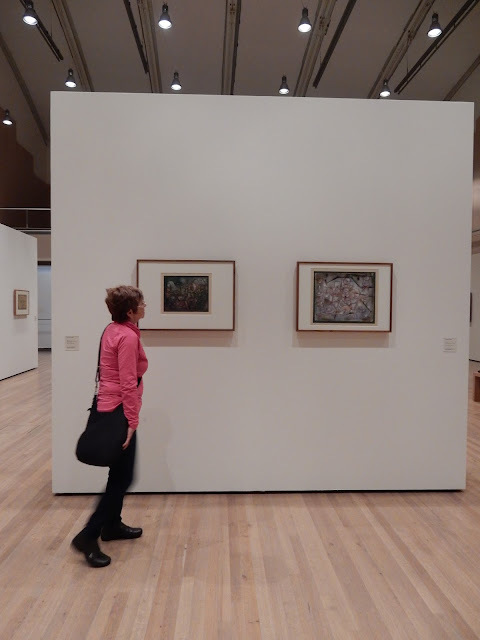 Regan is a big fan of Klee's art. As I have done with all my guests, I planned a visit to Bern on the Sunday. 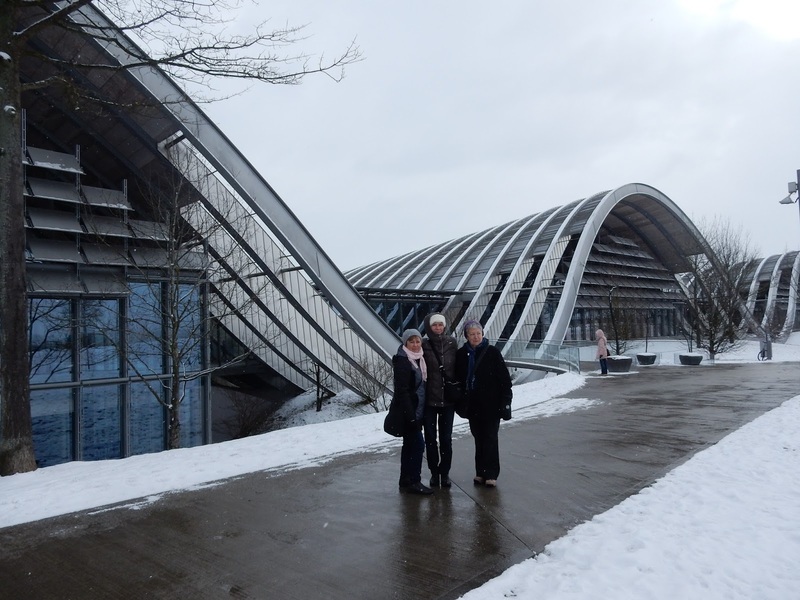 The weather was still very wintry, so we decided to spend part of the day inside the Zentrum Paul Klee. It was my first visit to this art gallery too, so I was excited to explore it. The usual Billinghurst walking tour was cut in half, as we relied on transit for part of the day. 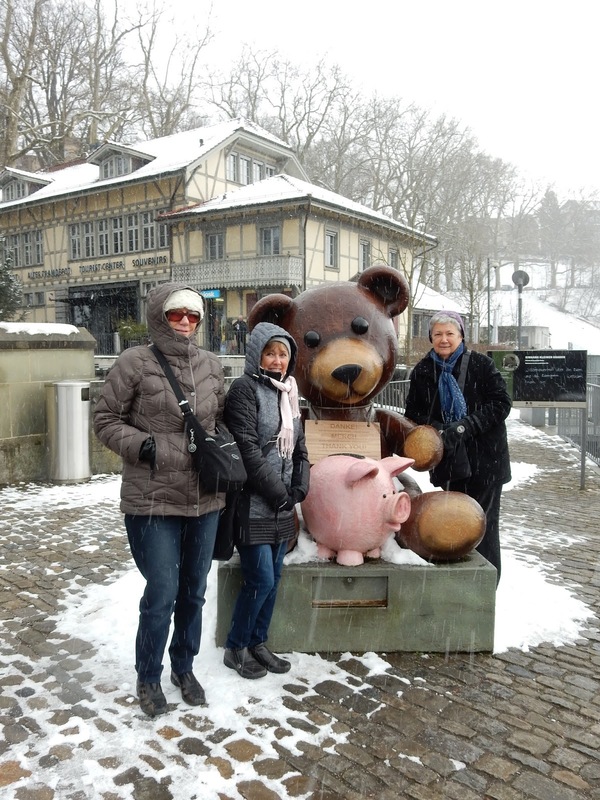 The Bern bears, escaping the cold, were nowhere to be seen, and we, too, stopped for warm drinks in the city to fight the chill. This was the only bear in sight at the Bärenpark. 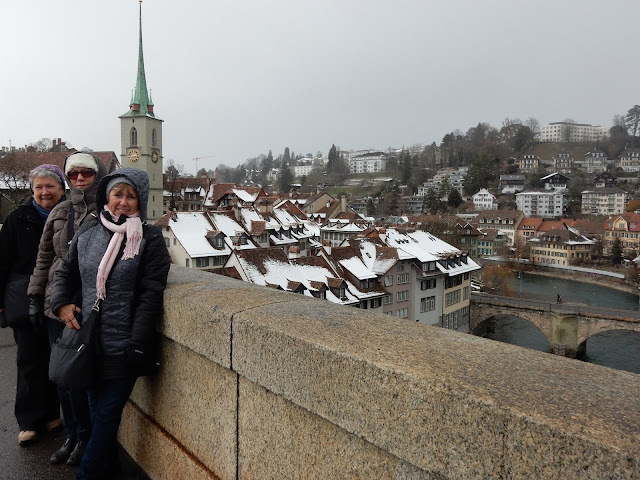 Even in the cold, Bern is lovely, and I was happy to show off the Swiss capital to my visitors. Now I can say I have visited it in every season. 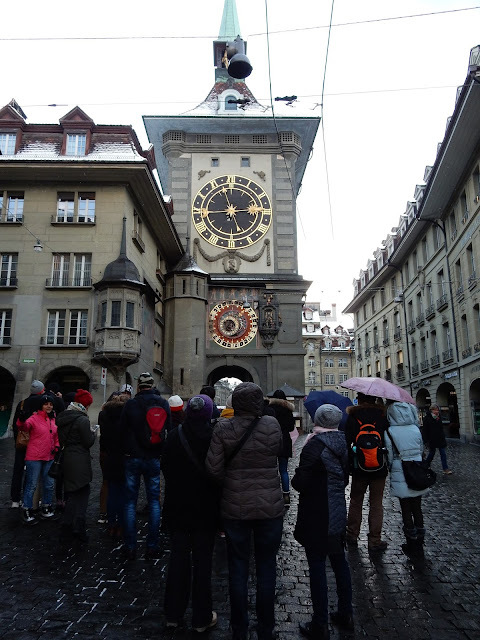 Watching the clock chime at 3:00 p.m.
Over the next week, since I had supervision responsibilities, I only spent one day with my friends, while they explored Swiss towns and cities by train and, one day, by car, with Susan's friend, Barbara. 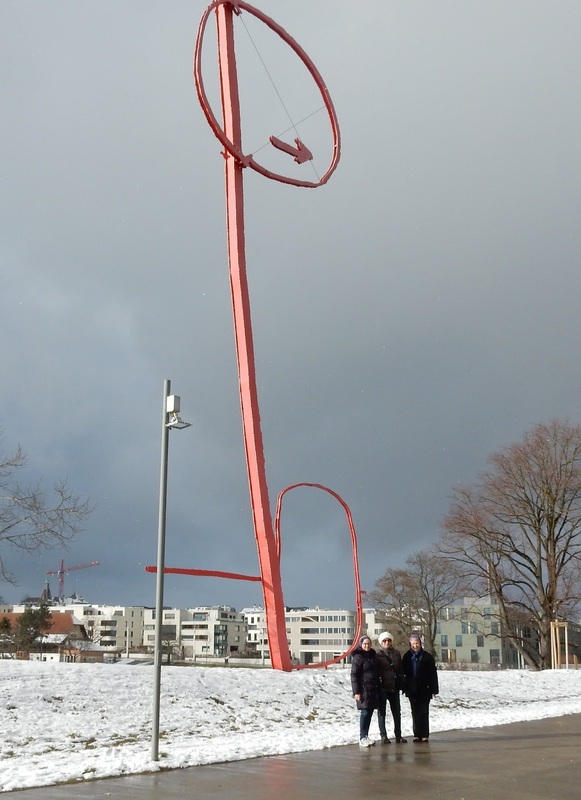 They made stops in Lausanne and Geneva, where they explored various museums. They most enjoyed their trip to Gruyères, however, since, on that day, the sun finally shone and the Alps emerged in blue skies. 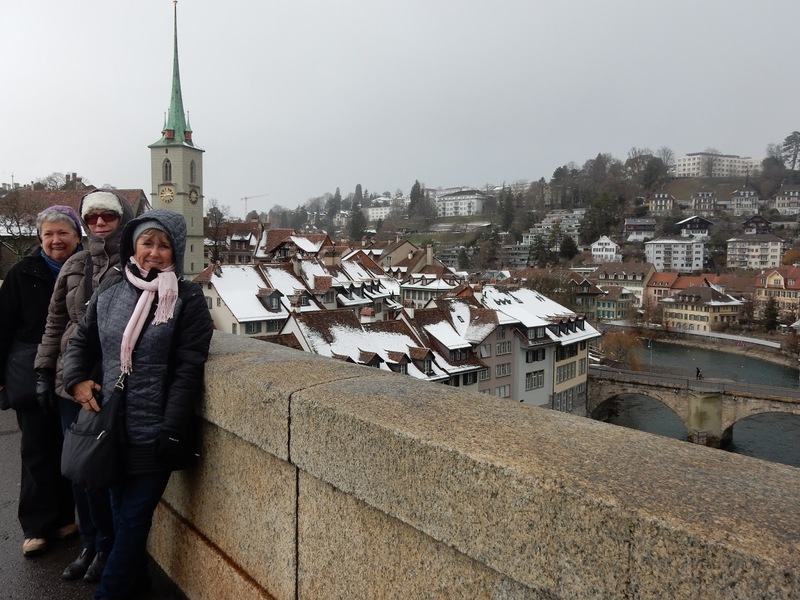 On that road trip, they also made stops at the Cailler chocolate factory, and the lovely town of Murten. On the Wednesday, I was able to free myself for the day. We decided to take the train across the border to Pontarlier in France, a 45 minute trip. 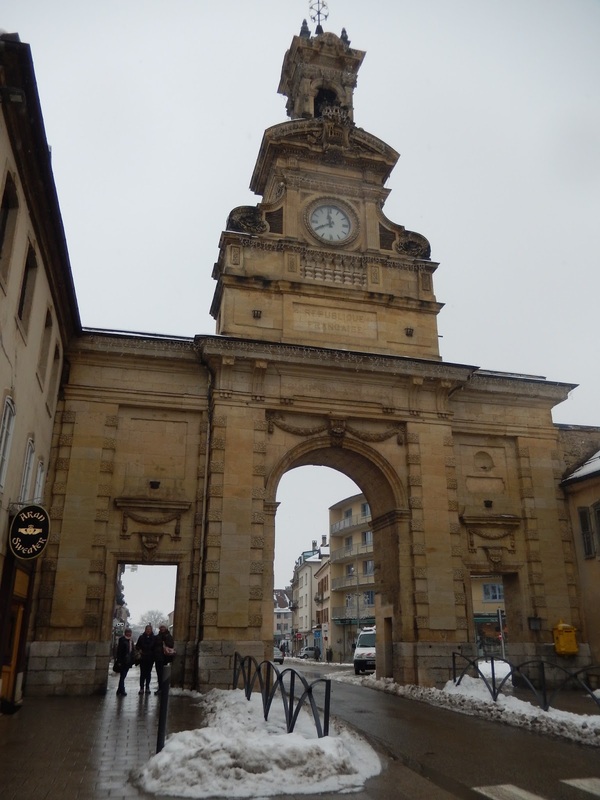 This town has a beautiful little church and its own "arc de triomphe" but more importantly, it has great shopping along la Rue de la République. 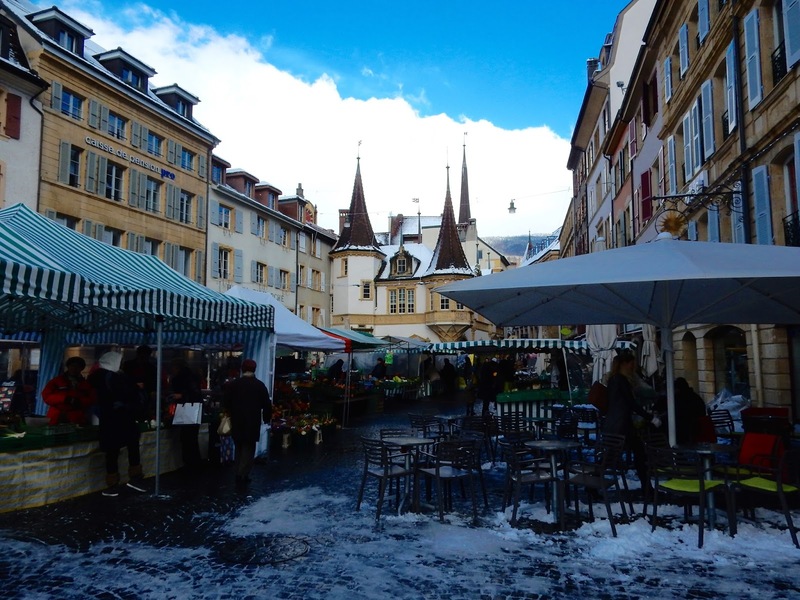 The January sales were on, and the prices across the border are more reasonable than in Switzerland. We were women on a mission! 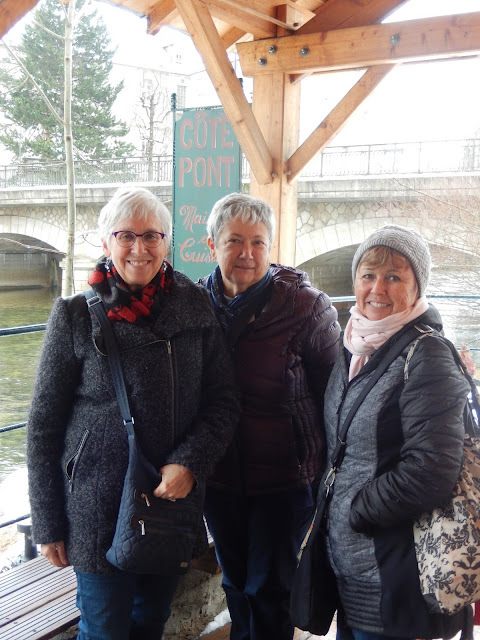 This was an enjoyable excursion which included lunch at a small establishment looking over the Doubs river. 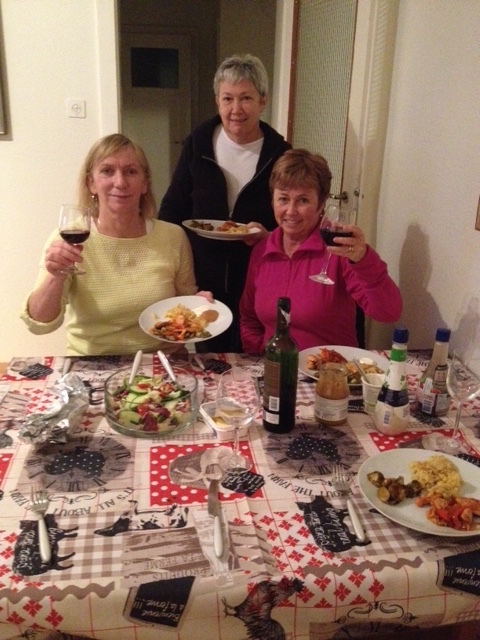 In the evenings, Susan, Regan and Ruth took very good care of me. They made dinner, cleaned up afterwards, and even reorganized the kitchen. By the end of the day on Thursday, my fellow teachers and I had finished grading, calculated final marks, and composed report card comments. We were free, as were the students! To celebrate, we had organized a talent night at a local school auditorium nearby. That evening, I was proud that my friends could see my three NESDA drama pairs perform their short plays, and that they could hear Laura's silver medal winning speech. 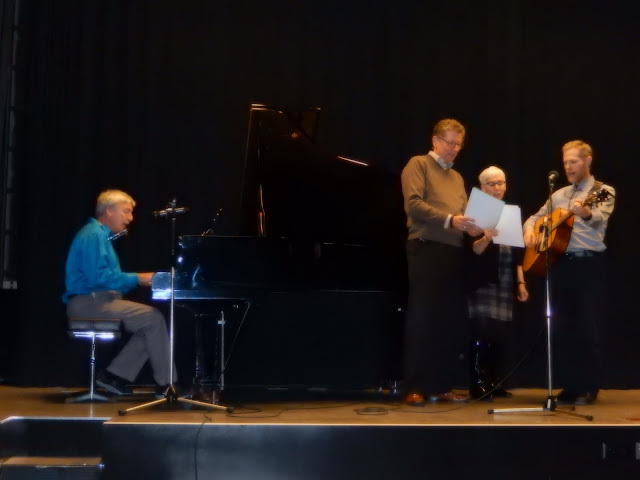 To close the show, the staff band reunited. It was fun to be on stage again. Terry, Bill, Aaron and I: the band sang The Band. The socializing continued afterwards over dinner at a crêperie a few meters away. The final day of the semester was set aside for parent interviews for me, while the girls headed off to Geneva. 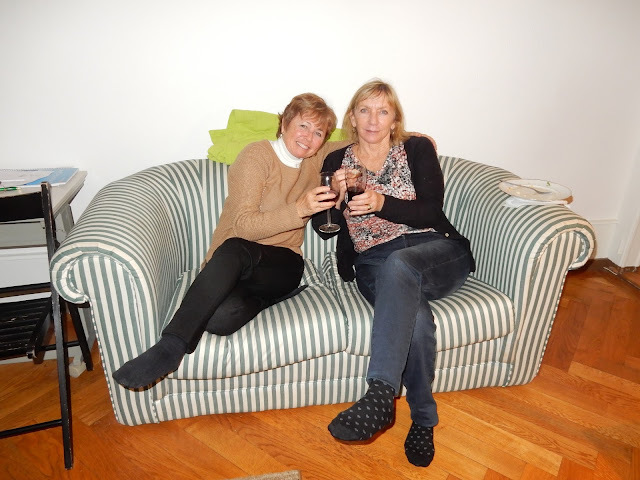 With impeccable timing, they returned just in time to join the apéro in the salon where they too met some parents. 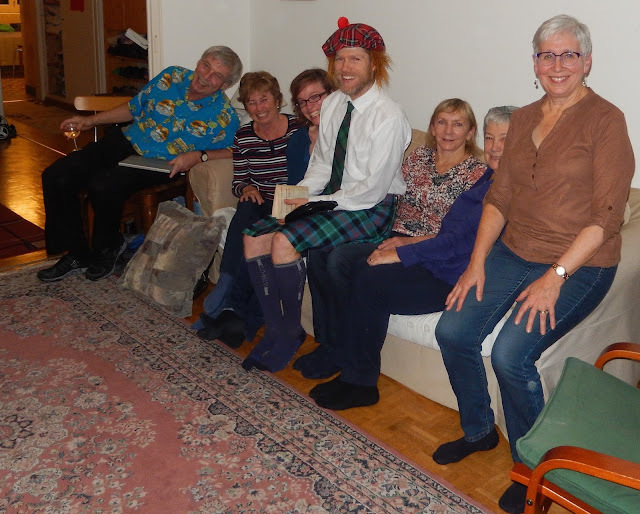 Our last night together in Neuchâtel was spent at yet another party, a Robbie Burns night at the Bellamy's home. 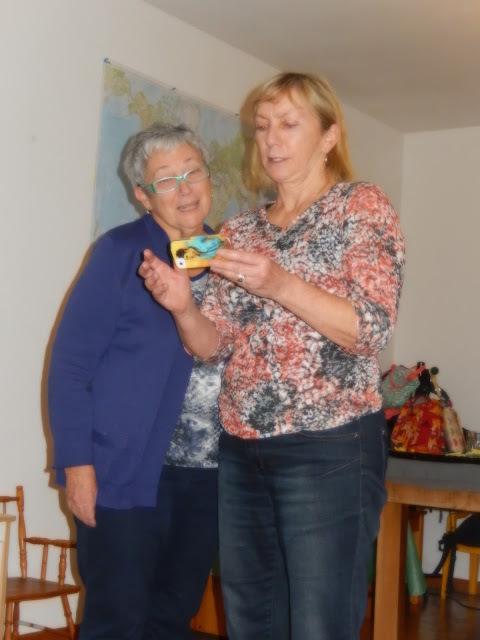 This was a celebration of poetry and music, in honour of the bard. 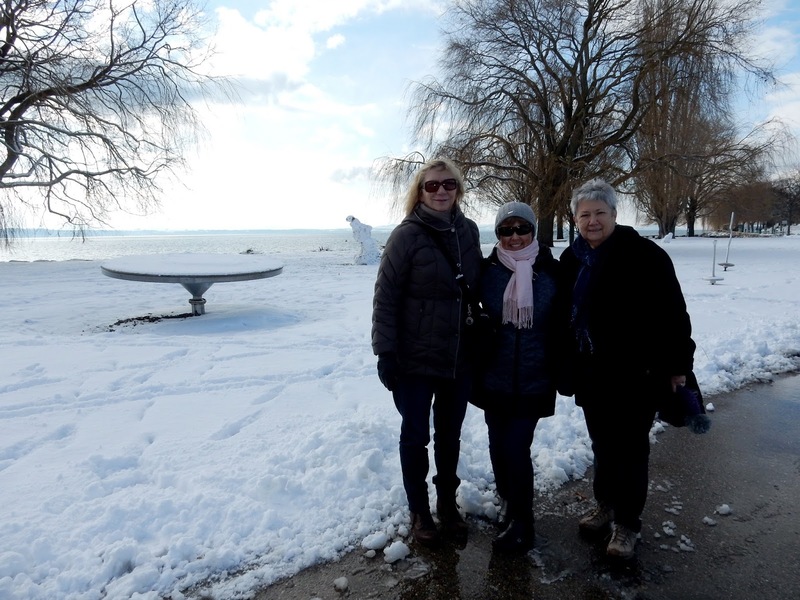 As they did with every other event during their week with me, Susan, Regan and Ruth jumped in with both feet. 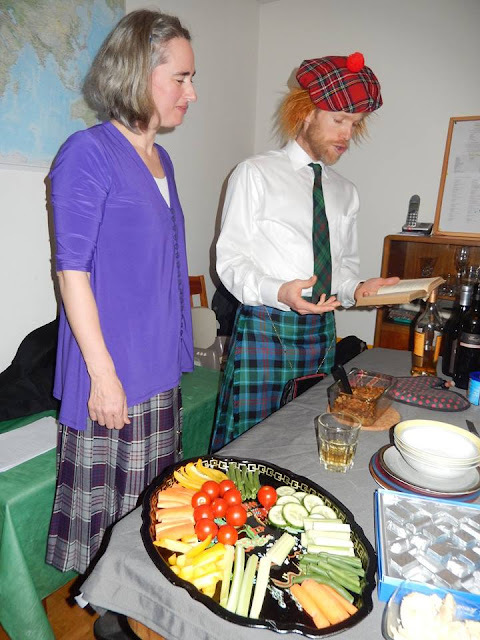 Our hosts, Beth and Aaron, read some of the bard, as they bless the haggis. Some of the crowd at Robbie Burns night. 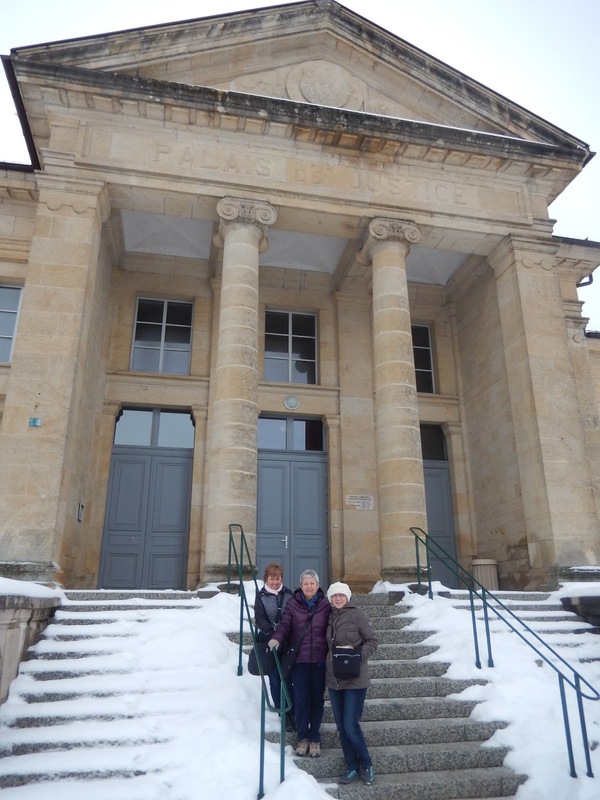 I would be remiss in this blog post not to do as my friends have requested–to thank the Neuchâtel community for their warm embrace of these three retired teachers. Susan, Regan and Ruth had a great time in spite of the cold and dull weather. It was a week to remember.